The movie opens with the Blastoise and Venusaur trainers from Mewtwo Strikes Back, battling said Pokemon. Cut to basically Episode 1 of the Pokemon anime -- it is almost identical in every way. Ash throws his alarm clock in his sleep, breaking it, and wakes up late as a result. By the time he gets to Oak's lab, all the Pokemon are gone but one. Pikachu and Ash meet, don't get along, but Ash is optimistic as they set out. When the Spearows begin to attack in retaliation for the thrown rock, and Ash and Pikachu run, one big difference occurs -- they never steal a bike to aid in their escape. After Pikachu saves Ash from the flock, they both pass out. When they come to, Ho-oh flies over them. Ash is given a good, long look at the legendary bird, who drops down one single rainbow feather, which Ash catches. 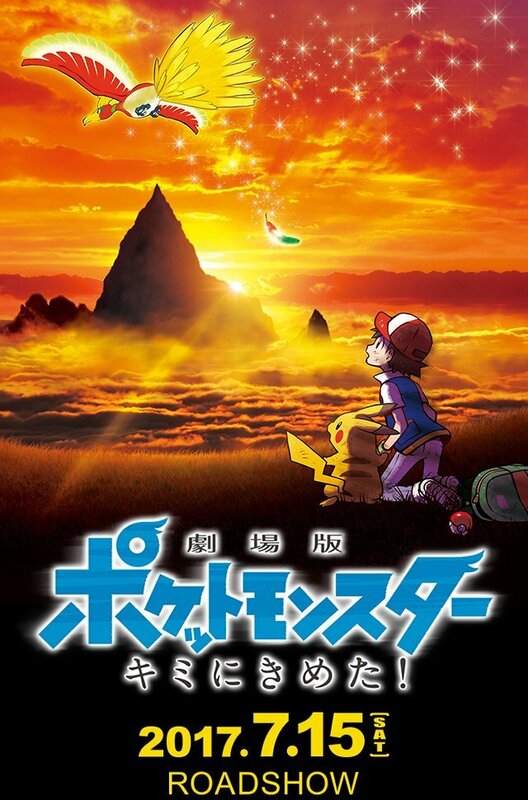 The movie continues to follow Ash's journey. He battles Erika, and says it's the third badge he's won after he defeats her. In the Pokemon Center later, a trainer, Makoto, asks Nurse Joy about a poster of Team Rocket, as Team Rocket listens in. Another trainer rushes in, his Vaporeon badly injured, after an attempt to capture Entei. Upon hearing Entei is nearby, everyone rushes out in a big hurry to attempt to catch it themselves (my note here is: it reminded me a lot of Pokemon Go). Makoto races Ash to Entei. She sends out Piplup, and another trainer, Souji, sends out Lucario. Entei defeats them all and escapes easily. Makoto challenges Ash to a battle after that, as Souji walks away. During their battle, they accidentally disturb an Onix, who begins to chase them (blasting off TR in the process). Ash ends up leaping in front of the rampaging Pokemon's path, and calms it down, with some help from Piplup. As they walk, they come across an injured Charmander. The Charmander gets excited when a trainer with a Midnight Lycanroc walks over -- Cross. Cross kicks the excited Charmander aside and walks on. Ash and Makoto pick the injured Pokemon up to try to find help while it pours rain, and come across Souji. He is at first furious they let Charmander get into that state, before realizing it's not their fault. They all hunker down in a cave as Souji helps heal it with some handmade medicine. While they wait out the rain, Entei enters the cave with some smaller Pokemon, and settles down to help keep them warm. Souji begins to tell the legend of Ho-oh, and how it revived Entei, Suicune and Raikou after their deaths in the burnt tower. Raikou represents the lightning that struck the tower, Entei the fire that burned it, and Suicune the rain that put it out. Entei seems rather interested in the rainbow feather Ash carries, as Marshadow looks on from behind it. Souji says only a hero usually has the feather. When Charmander recovers, it decides to travel with Ash, and the feather glows when it stays in the Pokeball Ash offers. Marshadow looks even more interested, lurking in the shadows. The trio decide to go to the end of the rainbow to find Ho-oh and battle it (TR decides to follow). While traveling, Makoto goes off alone near a lake at night, looking at photos on her phone of a woman (who looks like Cynthia). When she looks up, she sees Suicune watching her. She returns and Ash and Souji wish she'd called them to also see Suicune. Souji explains more about the feather, how is gains strength from good feelings, and loses power due to any sadness or conflict. As they talk together, Cross and his Lycanroc are lurking nearby. At a battle in town, Ash is challenged by Cross after a string of victories. He sends out Charmeleon (who evolved during their travels), who seems wary but determined to prove itself against its old master. Cross is skeptical despite the evolution. He lets Charmeleon beat his his Incineroar up until it powers up due to reaching a low level of HP, and with that boost, Incineroar wins, which Cross scoffs about. Ash is depressed and crushed, and cannot understand how he lost to such a horrible person with such bad training methods. He loudly says Pikachu could have won, which Souji and Makoto point out is cruel to Charmeleon, but Ash runs off as Marshadow lurks. He angrily continues to say such things as wishing his Pokemon had been Squirtle or Bulbasaur, and then he would have won, and Pikachu becomes angry. They become seperated and Ash's depression deepens as he continues to wander the forest. It is when he finally states that he doesn't even need Pokemon at all, that the feather begin to turn black and crumble, and Marshadow takes over his mind and sends him deep into an illusion. Ash wakes up as though living in the regular human world, everything black and white, and no Pokemon. He goes to school like a regular boy (and the professor is Agatha). While sitting in class, be begins to experiences flashes of his true life, a splash of yellow that is Pikachu running now and again. He looks up to see Ho-oh flying past the school, but it's really a plane. Souji and Makoto walk over to talk to him about normal, real-world topics, but Ash can only struggle to remember someone who was always beside him, and eventually begins to cry because he cannot remember. He ends up chasing the flash of yellow phantom Pikachu, and emerges back into his own world, out of the illusion. The feather has gone back to normal, and Ash reunites and makes up with Pikachu. Later, Souji talks about how Pokemon can be lost. When he was a boy, he loved his parents' Luxray, who always took good care of him. One day, when he was lost in a snowstorm, Luxray found him and kept him warm with its own body. By the time they were found, Luxray had died, but saved Souji's life. Souji is dragged away from the dead Pokemon, half covered in snow, screaming. In the forest, they upset a gang of Primeape who chase them, and Ash's Metapod evolves into Butterfree during the battle. Makoto sends his Lapras out so they can cross the water, and surfing music plays! Butterfree saves a pink one from a Fearow attack. Finally they arrive at the mountain Ho-oh is said to be at. Upon arrival, they see many Butterfree, and Ash lets his go, similar to the episode Bye-Bye Butterfree, and to that original soundtrack (half the theatre was sobbing over this scene). After Butterfree is let go, Raikou appears in a flash of lightning, completing the sightings of the trio. They come across an old man, Bonji, who is very excited by the Ho-oh feather. He says the beasts were near Ash since they were checking up on the person carrying the Ho-oh feather. Bonji is always aware that Marshadow is lurking around them. Before Ash is able to put the feather in place, Cross attacks. Marshadow watches as Charizard (newly evolved) and Incineroar battle, and Ash wins. He looks heartbroken, saying he also saw Ho-oh, but was not gifted a feather of his own. Ash says he wants to be strong, same as Cross, but also put importance in making friends. As he talks, Cross attacks him again, and takes the feather, stabbing it into the summoning place himself. It instantly turns black, and Marshadow grabs it next, its power now growing. Marshadow, now powered up by the feather, forces Lycanroc to attack Cross, but Charizard protects its former master. Then Marshadow forces all the Pokemon to attack everyone in chaos. Bonji says Ash must get the feather back to stop this. Ash, with Pikachu, battles his way towards it, as Cross pleads with Lycanroc, who is biting his arm. Marshadow changes form and begins to beat Pikachu half to death. Ash tries to protect Pikachu, standing in front of it and holding his arms out, declaring that he is Ash Ketchum of Pallet Town, reminiscent of when he protected Pikachu from the Spearow flock. Pikachu jumps up from behind him to protect him from Marshadow's attack last second, and there is an explosion. When the dust clears, Ash and Pikachu are lying side by side, badly hurt. Ash weakly asks Pikachu why it never gets in the ball, and Pikachu responds in human language, that it wishes to stay by Ash always. Ash is running through various landscapes as though in another illusion, while his body lays amongst the heartbroken Pokemon. As they mourn him, he is able to return to his body due to his strong love for Pikachu. The feather is back to normal, and Ash puts it into place, summoning Ho-oh. The legendary bird appears, and agrees to a battle with Ash. In the movie credits, all side characters through Pokemon X+Y appear: Brock, Misty, Tracy, May and Max, Dawn, Iris, Cilan, Clemont and Bonnie, and Serena!